Bengal Brigade is a curious film. An American made movie, set during the British rule in India in the 19th century, starring Rock Hudson as an Englishman. With a huge cast of turban wearing blacked up actors playing the repressed Indian natives. It hasn’t aged well. Made in 1954, only seven years after India regained its Independence, the action of film takes place in 1857 during the mutiny against the British East India Company rule, the suppression of which led to the creation of the Raj in 1858. It’s adapted from the 1952 novel The Bengal Tiger by Hall Hunter, the story deals with the Indian sepoy members of the East India Company army who revolted against their British commanding officers. 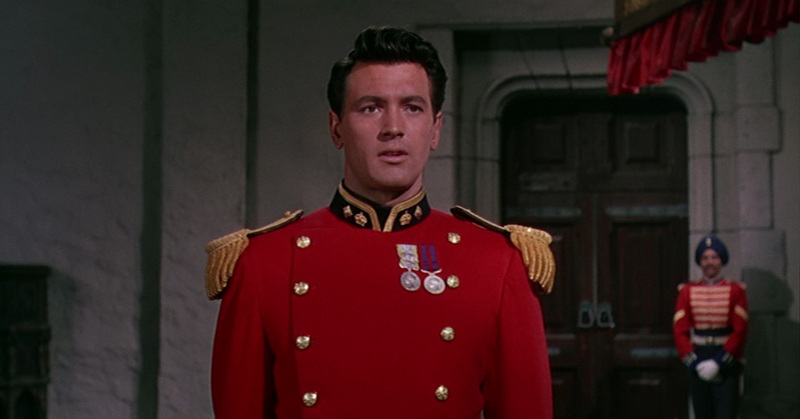 Rock Hudson, attempting no form of British accent, plays Captain Claybourne, one of the officers in the Bengal region where the revolt is about to happen. The sepoys under his command trust him and his affection for them is reciprocated. After a large opening battle sequence he is court-martialed for disobeying his orders to save his men. And that’s where the intrigue begins. We suspect he may well back up a bid for freedom. Unfortunately it’s just not very gripping. In fact it’s dull. Very dull. A boring love story thrown into the mix doesn’t help matters. On occasion the overwrought performance of Rock Hudson even comes across as amusing. It’s a shame – the subject matter is actually very interesting (it’s very surprising to see it coming form an American studio too), and would make a fascinating movie about the political story of colonised peoples enabling their oppressors. Claybourne’s sympathies are for the people under his command, but also for the ruling power above. Also the special effects and filming techniques are well done – applying the production methods of a Western cowboy flick to 19th Century India kind of works, even if the repeated use of the limited library of cowboy gunshot sound effects gets a little wearing. But it is truly astonishing that even in 1954 a film set in India could be made with NO Indian actors. None at all. Lots of blacked up American actors wearing turbans and fake beards, doing odd American/Irish/Indian accents. It’s really uncomfortable to watch. Bengal Brigade comes out on DVD on 18th April and is probably one for big Rock Hudson fans only.